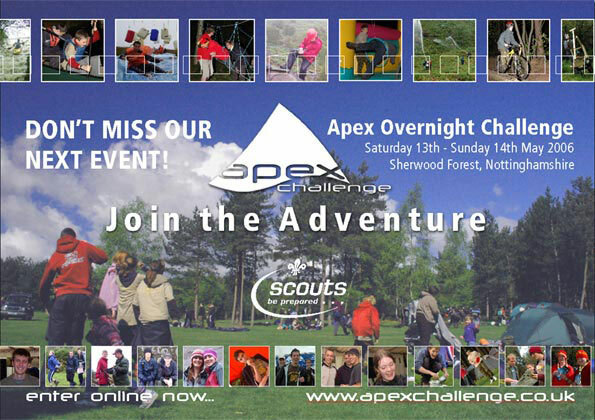 Now is the time to enter one of the biggest events on the Scouting calendar: the Apex Ovenight Challenge. This huge weekend competition is taking place in Nottinghamshire on the 13th and 14th May 2006. More than 200 Explorers and Network members are expected to take part in the event being held in a spectacular part of Sherwood Forest. More than a dozen exciting and challenging activities will be on offer including an exhilirating high level ropes course, super fast go karts and a wild canoeing experience. Teams will be entering from across the UK. Entry is in teams of four and at £30 per team it works out at just £7.50 per person including all food, camp fees and activities. It makes this easily the best-value Scout competition in the country. So check out the full details on the event briefing page, then gather together your team of four and enter online before the event fills up. There is space for 70 teams to take part. You won't be disappointed! You can save the flyer below which is a simple *.jpg graphic to include in emails to your friends to tell them about the event. Simply right click and select "Save As" to download it to your computer.